I just finished Biblical Womanhood and have a good start on Crazy Love. Highly recommend both!! As for the others, I'll tell you more when I get to them. So far this year I've already read The Full Plate Diet and The Things You'll See: Notes to my Children on How They Were Raised (by Lawrence Lucas). The latter of the two was also an excellent read! 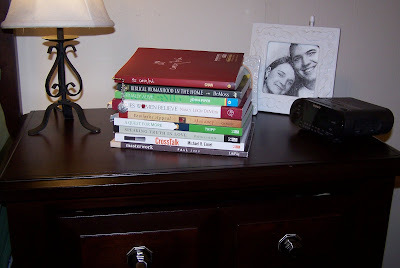 So what's on your nightstand?